Death Makes a Prophet by John Bude is another British Library Crime Classics book and it was first published in 1947. It has an introduction by Martin Edwards. I loved this one which kept me guessing right to the end. The setting is one of the new ‘garden city’ towns which were set up post World War 2. Welworth Garden City is obviously a bit of a mash up between Welwyn Garden City (I lived there briefly in the 1970s) and Letchworth, both of them in Hertfordshire – southern England. Welworth has the reputation of being a forward-thinking town which attracted people who were maybe a bit different from most – vegetarians, socialists and in particular people who were followers of unusual new religions. The cult of The Children of Osiris is one of the most popular religions and has attracted several thousand followers with many of them settling in Welworth. The religion was founded by Eustace K. Mildman who of course made himself the High Prophet of the sect and has thought up lots of odd rites for the followers to take part in, and he has obviously profited from it. The whole religion is being bankrolled by a wealthy woman and there are jealousies and resentments amongst the followers. Things come to a head which means that Inspector Meredith has to be called in to do his stuff. This is a great read with entertaining humorous touches now and again. The Lake District Murder by John Bude was first published in 1935, but I read the British Library Crime Classics reprint. This book begins well with a murder almost immediately, just the way I like it, but Inspector William Meredith gets completely side-tracked by another mystery for most of the book. Bude seems to have modelled his writing style on that of Freeman Wills Crofts, but he ended up being more convoluted and detailed than FWC and it became very tedious. He was so concerned with the plot that he made very little of the various characters, most of which are male. I longed for Mrs Meredith to make an appearance, but after a short but spirited spat with her husband the detective, she almost completely disappeared. Wick expectorated with a mingled air of disdain and disgust and pulled out a packet of Woodbines. He had now completed the charging of the petrol tank and was leaning back against one of the pumps, watching the Inspector with ill-concealed impatience. Wick slowly lit his cigarette, considering the point. Health and Safety would go nuts if you lit up whilst leaning against a fuel pump nowadays!! 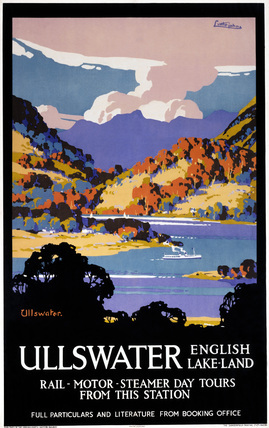 I found this book to be quite disappointing, but as usual the cover is a great one and it has been taken from a 1930s railway poster (LNER) advertising Ullswater English Lakeland, by the artist John Littlejohns. The Cheltenham Square Murder by John Bude was first published in 1937 but as you can see I read a British Library Crime Classics reprint. It has an introduction by Martin Edwards. 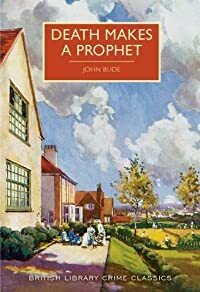 This is the second book by John Bude which I’ve read and I did enjoy it although it is a bit long-winded with all the possibilities gone into in depth. I’ve previously read his Cornish Coast Murder and you can read what I thought of that one here. Cheltenham has a number of squares that are really cul-de-sacs with the houses only being on three sides and in Regency Square the inhabitants of the ten houses that it comprises are at loggerheads over whether a tree should be cut down or not. They are a disparate group of people ranging from well-heeled to just managing to scrape along financially. When one of the neighbours ends up being killed as he sat by a window Superintendent Meredith is asked to investigate. Was it an accident or murder? I’ve found these British Library Crime Classic reprints to be a bit hit and miss, for me this one was a hit, although I still think that 1930s male crime writers in general concentrated too much on the minutiae of a mystery at the expense of the characters. The Cornish Coast Murder by John Bude, also known as Ernest Elmore, was first published in 1935 but my copy is one of those British Crime Library Classics reprints. I quite enjoyed this book but again I think that there must have been better British vintage crime books which could have been reprinted before this one. I think that if I had been given this book to read but not told that it had been written by a man it wouldn’t have been long before I realised that the author was indeed male. They always seemed to concentrate more on teeny details and timing, at the expense of character and background. Or is that me madly generalising? 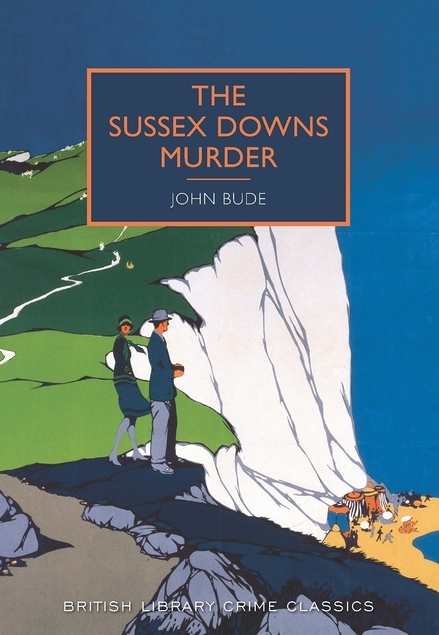 The setting is Boscawen, a small village in Cornwall, where Mr Dodd the local vicar and his friend the local doctor are in the habit of meeting once a week to have a meal and choose crime fiction books from a parcel of six which they have ordered from the library. They like to talk over the books they read and fancy themselves as connoisseurs of crime. When Julius Tregarthen a local magistrate and landowner is murdered in his own sitting-room the local police are baffled. Inspector Bigswell (I had a real problem taking that name seriously!) really hopes that he won’t have to call in Scotland Yard but with few clues as far as he is concerned, he needs help from someone, and that turns out to be Reverend Dodd. Bigswell is happy to have Dodd point him in the right direction and more or less solve the case. Completely different from poor Miss Marples’ experiences with police detectives of course – sexism no doubt. There’s also a policeman called Grouch, I don’t know if the names were meant to be amusing or what, anyway, I would give this one a 3 out of 5. I do love the cover though.